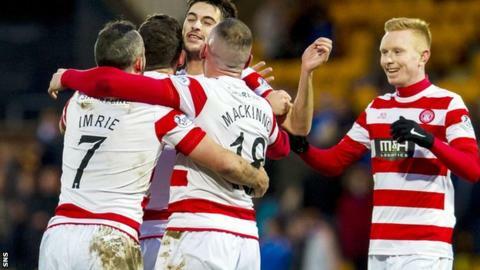 Tony Andreu scored his 13th goal of the season as Hamilton beat St Johnstone to go third in the Premiership table. Saints' Michael O'Halloran hit the bar from close range before Accies took a first-half lead thanks to Andreu's hooked volley. Accies striker Mickael Antoine-Curier hit the bar with a deflected drive after the break. And the hosts' James McFadden was sent off for a second booking when he tangled with substitute Eamonn Brophy. Hamilton are now level on 39 points with second-placed Celtic. St Johnstone's run of six straight wins was ended on 1 January with a 2-0 defeat at Aberdeen, while Hamilton hammered Lanarkshire rivals Motherwell 5-0 on the same day. Accies certainly looked the more confident in the opening exchanges as Andreu and Dougie Imrie had digs at goal, but Saints goalkeeper Alan Mannus was barely tested by either. When St Johnstone did finally venture into the visitors' box, they almost took the lead. A corner kick led to a goalmouth scramble and the ball fell to O'Halloran a few yards out, but his effort clipped the bar and flew over. McFadden then threatened to break the deadlock with a piece of magic. The former Scotland man collected the ball on the right, danced his way past two defenders and sent a curling effort towards the top corner, but it was just off target. McFadden's influence was growing as the half wore on, but it was Hamilton who hit the front, thanks to some slack Saints defending. Stephen Hendrie did the set-up work with a cross into the area from the left and the home defence simply stood back and watched the unmarked Andreu hook the ball home from a few yards out. It could have been 2-0 before the break when Ali Crawford sent Antoine-Curier in on goal with a sublime pass, but the defence put some pressure on the striker and he fired wide. Accies settled into their usual passing style at the start of the second half and almost went 2-0 up through Antoine-Curier. Imrie raced into the box and cut the ball back from the left, but the big striker's shot took a deflection off Steven Anderson and rattled the bar. O'Halloran almost got on the end of a McFadden centre, but the Accies defence was alive to the situation and the ball was cut out before it reached the Saints ace. The hosts went close to a leveller when McFadden's corner was fired goalwards by Anderson, but it was blocked a few yards from goal by a couple of Hamilton defenders. Moments later, McFadden was sent off for a second booking, after a foul on Brophy. The hosts tried to find a late equaliser, but Hamilton looked the more dangerous side on the counter and they saw the game out comfortably against the 10 men. Match ends, St. Johnstone 0, Hamilton Academical 1. Second Half ends, St. Johnstone 0, Hamilton Academical 1. Foul by Jon Routledge (Hamilton Academical). David Mackay (St. Johnstone) wins a free kick in the attacking half. Substitution, Hamilton Academical. Greg Docherty replaces Darian MacKinnon. Delay in match Dougie Imrie (Hamilton Academical) because of an injury. Substitution, Hamilton Academical. Louis Longridge replaces Ali Crawford. Second yellow card to James McFadden (St. Johnstone). Foul by James McFadden (St. Johnstone). Corner, St. Johnstone. Conceded by Stephen Hendrie. Substitution, St. Johnstone. Liam Caddis replaces Gary McDonald. David Wotherspoon (St. Johnstone) is shown the yellow card. Foul by Frazer Wright (St. Johnstone). Substitution, Hamilton Academical. Eamonn Brophy replaces Mickael Antoine-Curier. Foul by Michael Devlin (Hamilton Academical). Steven Anderson (St. Johnstone) wins a free kick in the attacking half. Foul by Mickael Antoine-Curier (Hamilton Academical). Delay in match Frazer Wright (St. Johnstone) because of an injury. Attempt saved. Michael O'Halloran (St. Johnstone) left footed shot from the centre of the box is saved in the bottom right corner. Corner, St. Johnstone. Conceded by Martin Canning. Foul by Michael O'Halloran (St. Johnstone). Michael Devlin (Hamilton Academical) wins a free kick in the defensive half. James McFadden (St. Johnstone) wins a free kick in the defensive half. Corner, St. Johnstone. Conceded by Jon Routledge. Attempt missed. Ali Crawford (Hamilton Academical) right footed shot from outside the box is high and wide to the left.